How hard can it be to go to the movies in France? 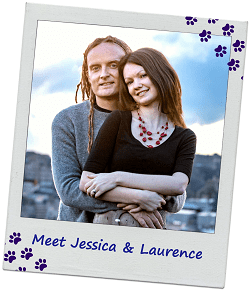 We found out it is not super difficult, but it did turn out to be a bit trickier than we expected. While in Paris this past Spring, we decided after a long travel day that we wanted to see a film. We found the film listings in Pariscope, but then we were a bit surprised to have some difficulty interpreting the movie listings across the multitude of cinemas in Paris. What is the difference between v.o. and v.f. films? What does sf Lun mean? How do I make sure I am seeing the new release of the movie and not an older version? At the time, we couldn’t locate any good online English resources to help us interpret the movie listings, so we thought we’d share our experience and tips here to help others who may be trying to watch a movie in Paris or elsewhere in France. This post should help you interpret many of the abbreviations found in movies listings in both print and online cinema listings. Step 1: Choose a resource to discover which movies are showing. Depending on where you are in France, you can check out online websites or check a local newspaper or magazine. We recommend the Time Out Paris website (in English and French) for movie listings and to find out what is going on in the city. 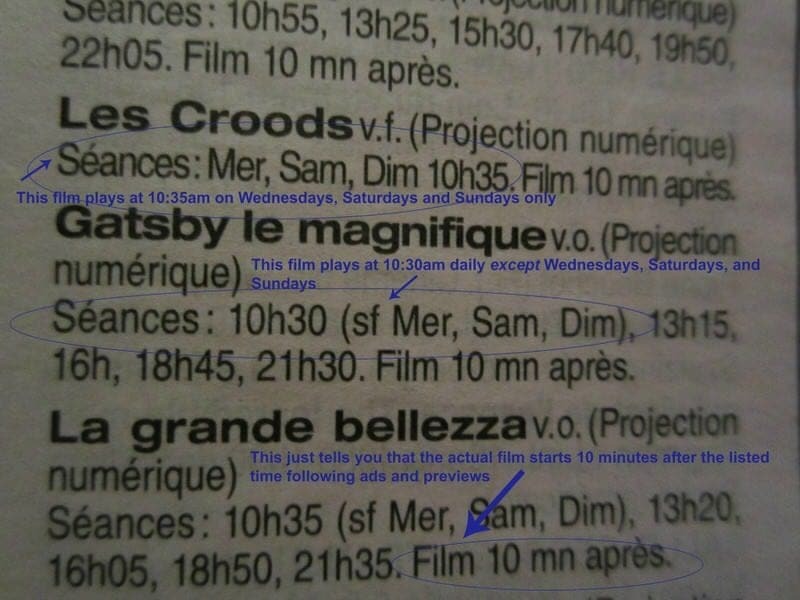 NOTE: We did this example using a Pariscope magazine, but it should work with any sort of cinema listing whether in print or online. The weekly magazine Pariscope stopped publication in October 2016, and was once the go-to guide for entertainment in Pairs. Pariscope still maintains a website but does not seems to report cinema listings any longer. 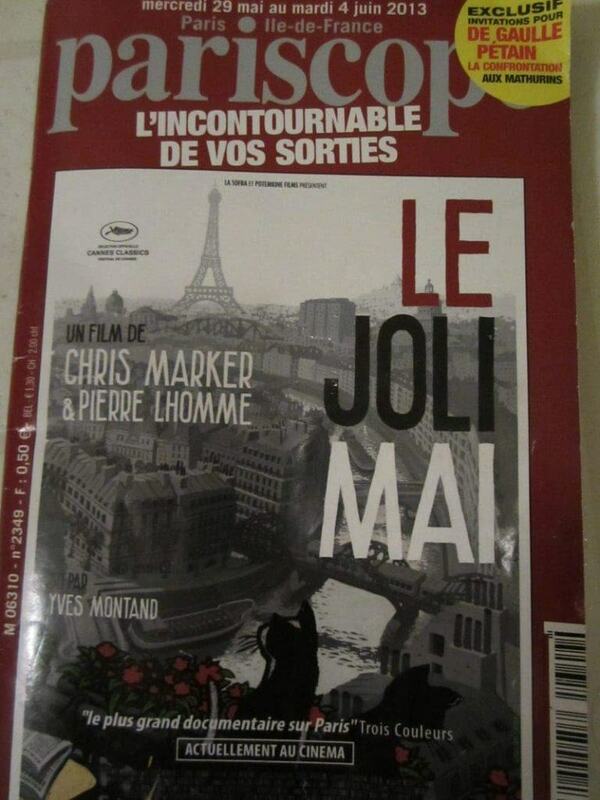 Our Experience: So we purchased a copy of Pariscope at a Marais bookstore (0,50 euros) and used it to get the movie and cinema listings. 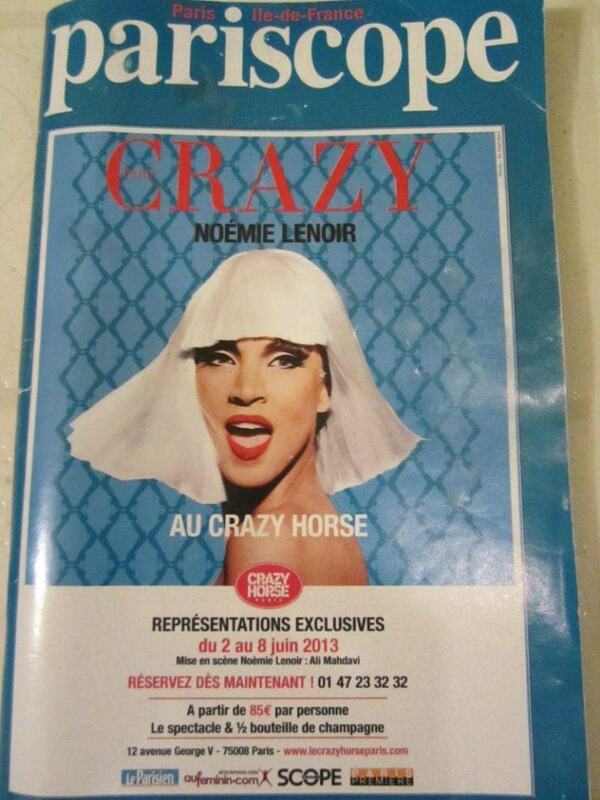 Pariscope magazine – notice the two black cats on the front…. Step 2: Figure out where the movie is showing. In Pariscope, go to the Cinema section and check out the films nouveaux (new films) section which will highlight all the newer movies, autres films (other films) section for those films that have been out for a while, and reprises for older movies and classic films. After each film description will be a list of all the local theaters showing that film. Caution: If an older version of the film you want to see exists make sure you check to see if it is also being shown in town as you want to make sure you go to the right version. Our Experience: We already knew we wanted to see The Great Gatsby (2013) that had just recently been released (for some reason it is listed as 2012 in Pariscope…even though it was released in 2013). We found it listed in the “autres films” section of our Pariscope. 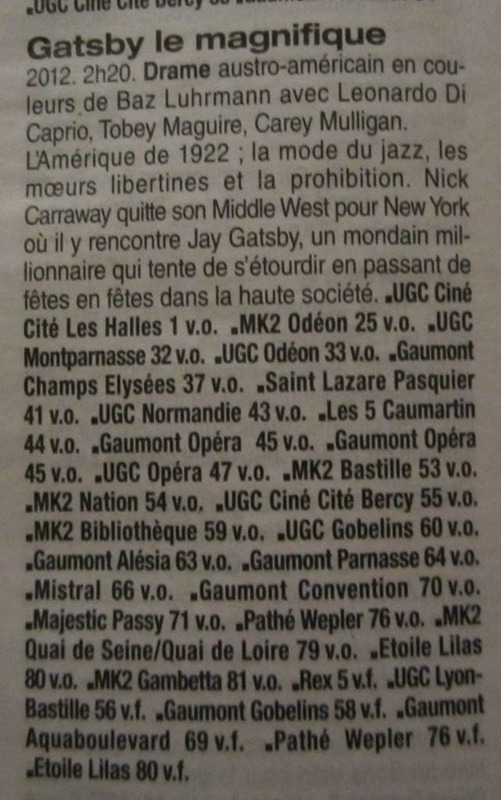 We also noted that it was called Gatsby le Magnifique in French and that it was playing in a bunch of movie theaters all over Paris. 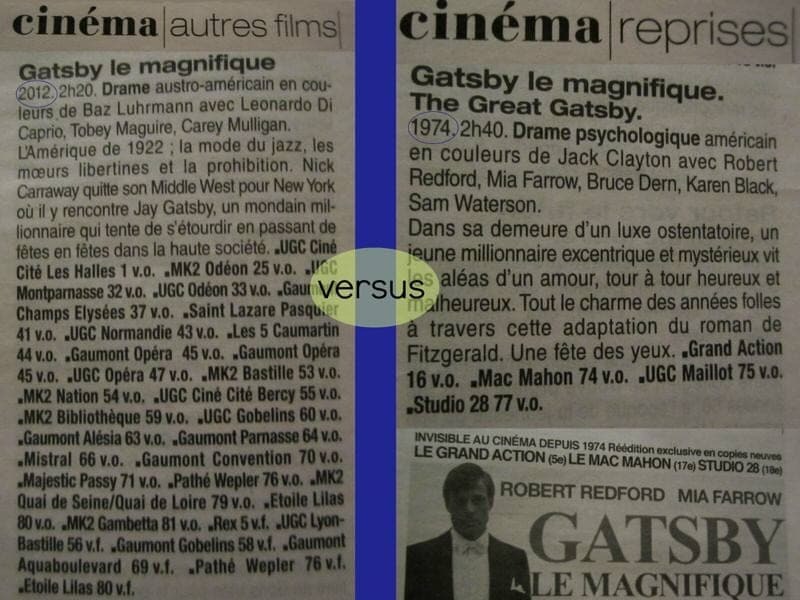 Now, we were then surprised to also see Gatsby le Magnifique listed under “reprises” as a few theatres were playing the 1974 version of the film. Clearly, this was being done just to trick us! So take note that it is possible that prior versions of a film (if they exist) may be playing as well. We found it almost impossible to distinguish the old from new version from just scanning the individual cinema listings so make sure you check the film listings first to then crosscheck which movie theaters are showing each version. Generally, a theater will not be showing both versions although this is of course possible. Step 3: Figure out the type and version of the film you want to see (if you have choices). This is probably the most confusing part as there are a lot of abbreviations used in the cinema listings in France. But this is where you can choose whether you want to see the film dubbed in French or in its original language with French subtitles and whether you want to see it in 3D or not. If you are in a medium to larger town and want to see an international movie (not made in France), there will likely be at least one theater nearby showing it in v.o. and one showing it in v.f. Special Note: A listing for the movie that does not have v.o. or v.f. after it normally indicates it is an actual French movie and is shown in French with no subtitles. 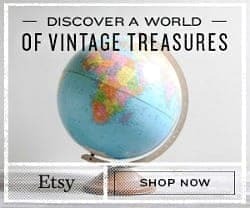 Our Experience: Now if like us, you don’t understand enough French to watch and understand a movie in French, you will want to avoid anything denoted as v.f. as it will be entirely dubbed in French. If you are looking for something that is not in French, such as an English language film, look for a movie that is denoted as v.o. AND was filmed in English such as an American or British film. It is very easy to find English-language movies in France, as many of the films in any given large cinema tend to be American. So as we watched a non-dubbed original version (v.o.) 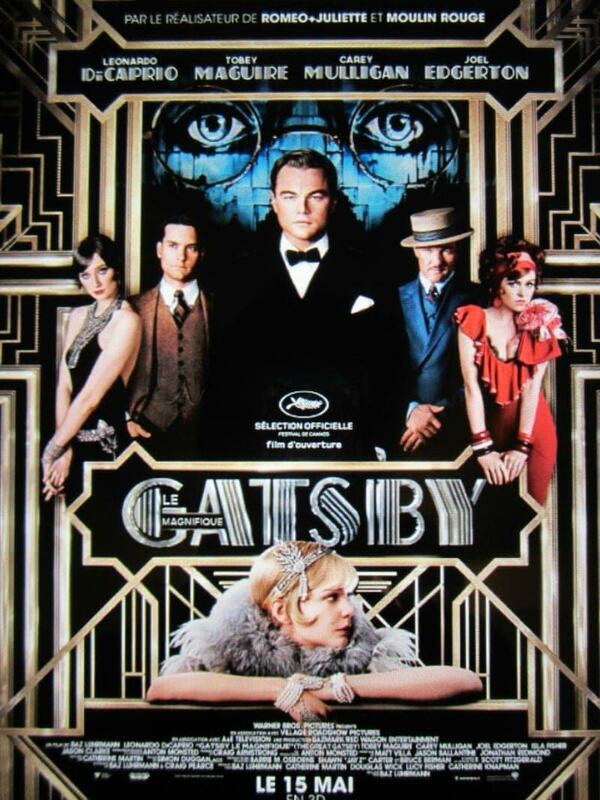 of Gatsby le Magnifique, the movie was in its original English but French subtitles were shown throughout the movie. We were not interested in seeing the movie in 3D (note that like in the United States there are generally extra charges for 3D films) so we avoided listings that noted “en 3D”. Step 4: Pick a cinema and movie time. Now once you’ve decided on the film and preferred version, you can then figure out the closest cinemas and find movie times. The address of the theater, movie times, prices, etc. are generally fairly easy to figure out. Our Experience: Since we were near the 6th arrondissement area of Paris, we checked to see which movie theaters were closest to us. It was helpful that the Pariscope organizes the theater listings by area. We then saw that a few different cinemas were playing this movie in the 6e Odéon area. 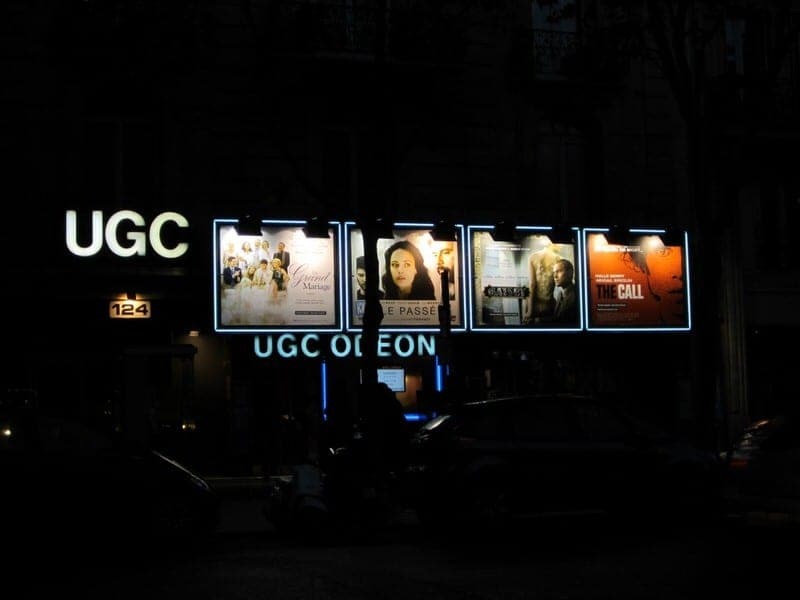 We wanted to go around 9:00pm or 9:30pm and saw that the 33 UGC Odéon theater was playing Gatsby le Magnifique in v.o. at 9:30pm (a.k.a. 21:30). This met all of our requirements. Perfect! We had just arrived in Paris after a long train ride from Switzerland and a quiet evening watching a movie really hit the spot for us that day. This was our first movie theater experience outside the United States. A couple of things we noted was that the theater we went to was quite small and we were not allowed to hang around the lobby and could not enter the actual theater until 15 minutes before our show time. We got there about 30 minutes or so early and bought our ticket but then had to wait outside which normally would be fine except it was raining. Otherwise, the experience was much like we have had all over the United States. While it would have been nice to watch an actual French film, we would have needed English subtitles to really enjoy it, especially as tired as we were that evening. However, since I associate F. Scott Fitzgerald (the writer of The Great Gatsby) with the time he spent in Paris, it felt like a good fit. 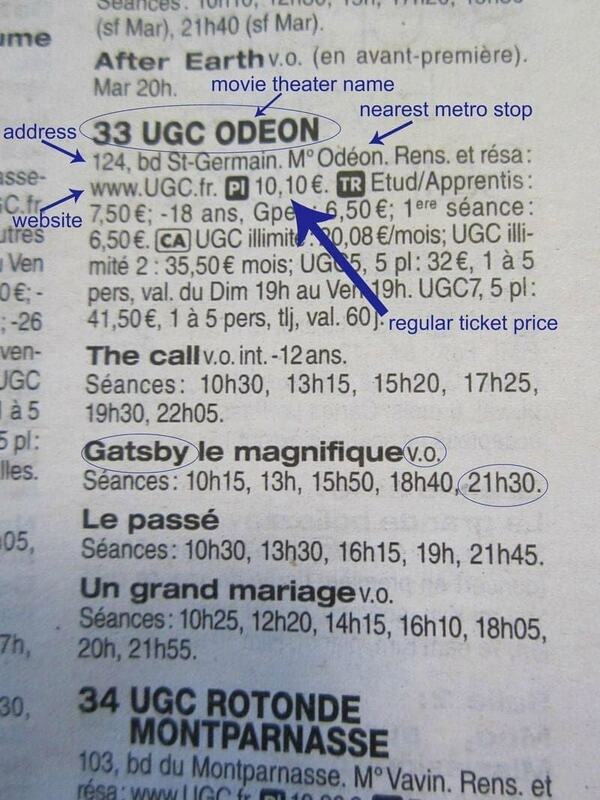 We hope that this little guide will help someone else out there trying to decipher French movie listings! Have you gone to the movies in France? 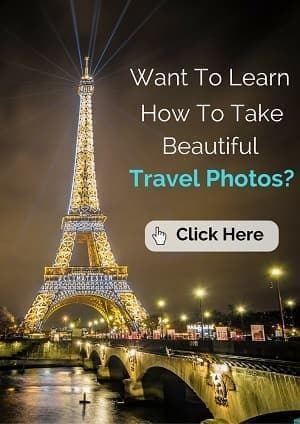 Any tips for attending the cinema in Paris? Hi. I was recently looking at the website for a movie theater in Paris. On their site, they have two viewing options; vf like you meantioned and vf en first. When I looked, movies like Antman and the Wasp had both vf and vf en first showings. Have you ever encountered this or do you know what it means? Um, I have not seen “vf en first” on cinema listing before and am not really sure what it means. VF means that it is dubbed into French and “en” in French means “in” in English. So I am not sure that that would mean that would be different than just plain VF. But if you find out, I’d love to know. VFST means that it is dubbed in French and shown with subtitles for those who are deaf or hearing impaired. If you are looking for something in English, it should have v.o. next to it. 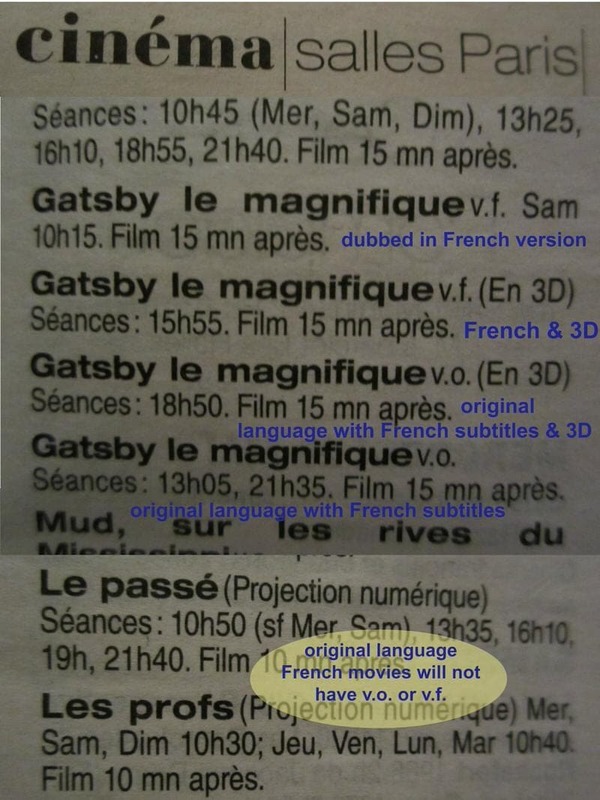 Most non-French movies in France are dubbed but you’ll find them shown in their original language in cinemas in the larger cities like Paris and Nice. Hi, This post about French movies was very useful to me, too much codes in movies in France. It’s nice that they give you so many choices to watch films in Paris. From subtitles, dubbed, to 3D, and more, there really is a wealth of variety. We are an organisation called Lost in Frenchlation and our objectives are to bring the best of French cinema to the English-speaking people in Paris by showing French films with English subtitles, and to facilitate the international community meeting each other as well as native Parisians. We are holding monthly screening of French films with English subtitles at independent cinemas in Paris, with a convivial cocktail hour before the movie for catching up with friends. We are writing to you because we believe that we are offering an experience that your English-speaking community have been denied for a frustratingly long time (we know from experience). Jessica, this totally brings me back to the days when I pored over Pariscope! My favorite Parisian movie experience was an all night Tim Burton marathon in the Latin Quarter. I was a young college student then and it wasn’t a problem to spend the night at a random movie theater and looking back on it I am so glad I did! Amy, that sounds like so much fun! What a wonderful memory! Wow! This is so helpful! I’ve paged through a Pariscope before and has NO clue what was going on, even though I understand French pretty well. Yeah, you’re right, because of all the abbreviations they use it is really quite confusing even if you do know French but are not familiar with watching movies in France. 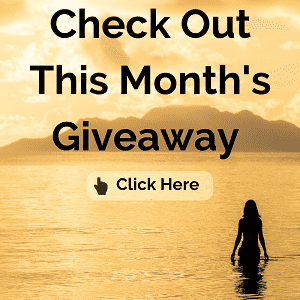 Great post with lots of useful information! All those different codes by the movie listings would be sure to confuse me. Luckily in Iceland I don’t have to worry about a film being dubbed unless it is a children’s movie. One different thing about the movies here though is half way through the movie they stop it for a ten minute break. It took a bit to get use to but now I enjoy having that break and miss it when I am back home in the states. Thanks! Interesting that there are regular intermissions in Iceland. That is kind of nice actually since a lot of people need to get up to go to the bathroom or stretch anyway.